Water World is a large water park on the edge of Lloret de Mar in Spain's Catalonia region. It has lots of water rides, slides and pools and makes for a great day out with children. Water World is one of the main water parks on the Costa Brava. 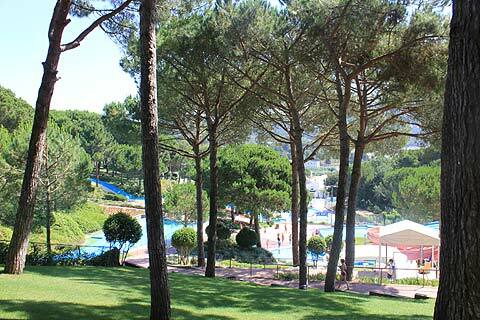 This large water park has lots of different rides suitable for toddlers up to teenagers and adults. For those interested in thrills both Water Mountain and X-Treme Mountain fit the bill. Both are big dipper type rides where you sit on a dingy which travels uphill in order to launch you into a ride of ups and downs with scary turns and drops. Water Mountain also has a section in the dark. Both were firm favourites with the teenagers we visited with. Another thriller is Storm which has a long descent in enclosed tunnels at the end of which you whirl around the 'saucer' at the bottom until you are dropped through the whole in the middle. The Kamicaces are steep descents of 77m during which you can achieve speeds of 60km/hr. Not for the faint hearted. As well as these rides for the older and braver kids there are wave pools and pools with a range of water activities for toddlers and small children. Coming soon are two new vertical-descent water rides and some speed-slides allowing you to race your friends and family down adjoining slides. One of Europe's biggest bungee jumps is also at the park - a staggering 80m drop. There are a number of different snack bars and a restaurant as well as a picnic area at Water World. Water World is open from the middle of May to the middle of September. Opening hours are 10h00 - 18h00 in low season increasing to 19h00 in July and August. If you are looking for more water parks to visit then there is Aquadiver at nearby Platja d'Aro and Aqua Brava at Roses a little further up the coast.